Congrats on the success and fun! Architectural ruins, blasted down by Augustine's bookish power ... at least that's what I assume. You have easier access to the whole thing than I do, Karl, if you want to check out the mis en page (I assume the image is cropped): the ms is held by the Morgan. And a mighty fine image it is too. 'By the power of the two iPods I hold in my hand, I banish thee, demon!' 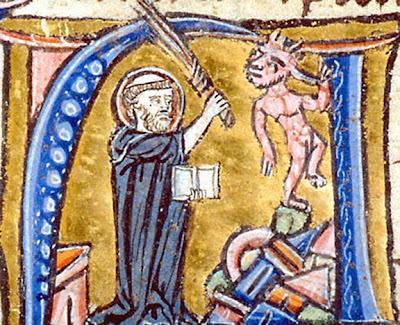 Mind you, don't you think it looks as though the Bart-Simpson-esque demon is nimbler than the saint's smiting? I get the impression he'll leap merrily from pillar to pillar, just ahead of the threshing flail. In other news: Stephen Greenblatt was in Monty Python? You sure about that? Would I spread nonverifiable information? Check this out, Adam. Also while at Yale (Ph.D. 1969), Greenblatt "rushed out of a corner drugstore and knocked down an elderly man who turned out to be T.S. Eliot. He survived." And, while studying for a B.A. (1966) and M.A. (1969) at Pembroke College, Cambridge, he performed with a group of students who went on to become the Monty Python's Flying Circus troupe. "My name occasionally turns up in the early shows," he said, "usually in grotesque situations and invariably drawing a somewhat mysterious laugh from the studio audience." I had no idea about the Python thing but I've just looked at the scripts and it's true. See here: he's mentioned in episode 27 at the start of series 3, so not really one of the early shows. I've also checked the official Just the Words books which I've had since the 80s (just in case it was an elaborate web based hoax) and they agree with that site. I think someone needs to investigate the complex and very important cultural matrix of Monty Python and Medieval and Early Modern Studies.